About 400 people united to hold a protest rally against the construction of new helipads in the U.S. military's Northern Training Area in Takae, Higashi on August 19. On the afternoon of August 19, about 400 people gathered in Takae Ward of Higashi Village to hold a protest rally against the construction of new helipads in the U.S. military’s Northern Training Area (NTA). The people taking part in the rally aimed to prevent the gravel used for the construction from being brought through the N1 zone gate to the NTA. 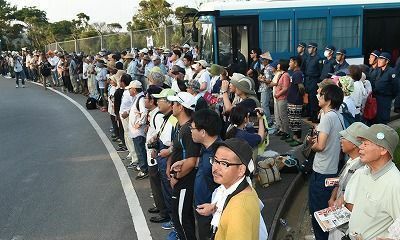 After 5 p.m., those protesting assembled a line of about 180 cars and drove them at a reduced speed from near the Higashi village office in Taira to the main gate into the NTA. The protesting citizens parked the cars around the gate and staged a sit-in to completely block off the main gate. As of 7 p.m., there had been no confirmation of a lockdown or roadblock of Prefectural road 70 by riot police, nor had there been confirmation that trucks had carried the gravel into the NTA.